Easter is a lovely time for a break in Bergamo as the weather is beginning to warm up and the spring flowers are in bloom. 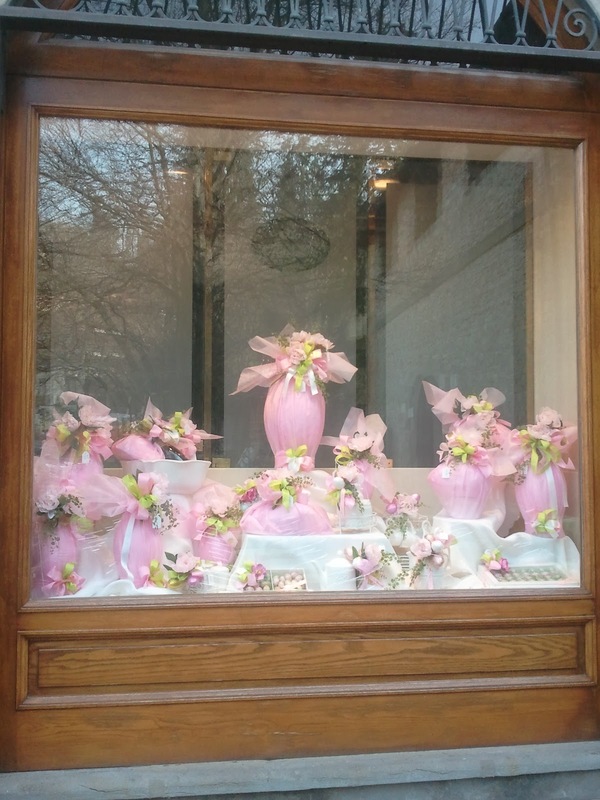 In the run up to Easter many Bergamo shops will have elaborate displays of chocolate eggs in their windows. Italian Easter eggs are usually wrapped artistically in coloured cellophane and tied with pretty ribbons. They often contain a toy, or in the case of Easter eggs for adults, a gift, which can sometimes be as substantial as a mobile phone! There are some fascinating chocolate and cake shops in Via Colleoni in the Città Alta (upper town) and down in the Città Bassa (lower town) there is a well-stocked chocolate and sweet shop in Via Tiraboschi, a left turn off Viale Papa Giovanni XXIII at Largo Porta Nuova. The shop also sells a selection of boxes of chocolates and biscuits - ideal to take home as holiday presents. Although Venerdi Santo (Good Friday) is not a Bank Holiday in Italy and the shops are open as usual there will be special services in the churches and some areas will have processions and events. On Easter Sunday, while the world tunes in to watch the celebrations in Rome on television, services will be held at churches all over Bergamo. The restaurants in Bergamo will be busy at lunch time as families go out to celebrate la Pasqua (Easter) together and many will be serving a special menu. If you are looking forward to a good lunch it is advisable to book somewhere in advance. A traditional Easter meal for Italian families, whether they are eating at home or in a restaurant, is likely to centre on agnello (lamb) as the main course, either roasted or braised. La Colomba (the dove) is known as the bird of peace and there is a legend that says a cake in the shape of a dove was offered to try to end a siege at Pavia. If the weather is warm and sunny, consider a day out at one of the lakes near Bergamo during your stay. You could take a bus to the resorts of Sarnico, Tavernola Bergamasca or Lovere on the western shore of Lago d’Iseo. Or you could go by train to Brescia , where you then change to the train to Edolo that runs alongside the eastern shore of the lake. The train stops at Sulzano and from there you could make the short crossing to Monte Isola, the largest lake island in Italy and southern Europe. From Brescia you can also take a train to Desenzano del Garda on Lake Garda , from where you can go by boat to Sirmione or Bardolino. And it is only half an hour by direct train from Bergamo to the beautiful lake resort of Lecco at the foot of Lago di Como.